Get the best combination of sweet and salty flavors when you serve Paragon kettle corn made from these Paragon 1009 kettle korn portion packs! Your place for popcorn products, Paragon has a great selection of concession favorites that are all Designed for use with your 6 oz. popcorn popper, this portion pack includes everything you need to create fantastically-flavored popcorn for your venue. Rather than keeping your kettle corn ingredients separate, store them together in one convenient package! 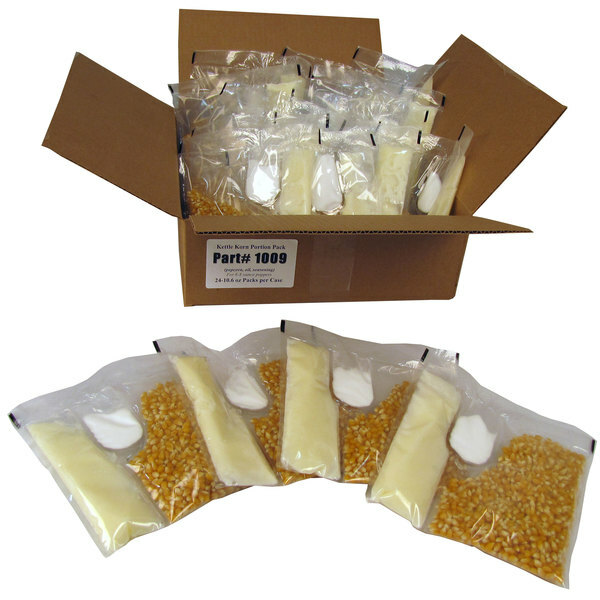 Great for storing and stacking, this lightweight plastic pack includes kernels, oil, and a sweet and salty kettle corn flavoring to pour into the mix. No traditional copper kettle is needed to make Paragon's kettle corn. Easy-to-use, these portion packs offers the same sweet flavors with the convenience of a countertop popcorn machine. The popcorn will have the same light color and unique taste that your customers expect when they order kettle corn instead of regular, buttered popcorn. Kettle corn has a slightly toasted taste that's seasoned with just the right amount of salt. A carnival favorite, patrons of your sports stadium, movie theater, or concession stand will also enjoy the one-of-a-kind taste that kettle corn has to offer. These kits come with everything you need to make delicious popcorn right from your own home! The flavor is great and the price is affordable. Save Up To $14.16 with our Recommended Product! 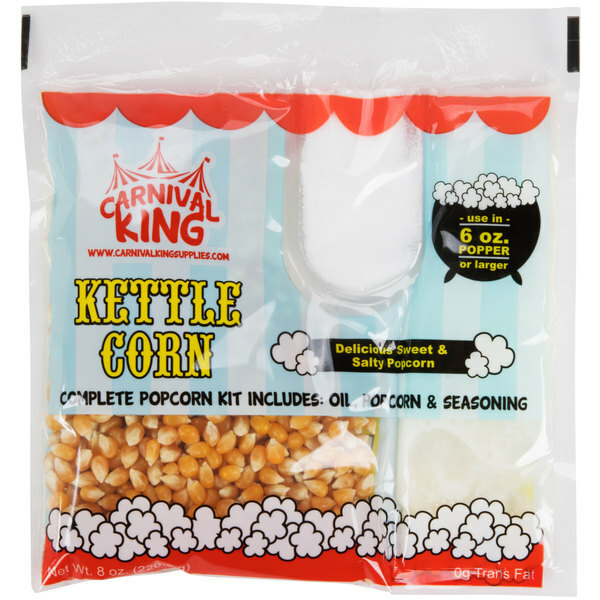 Try this Carnival King all-in-one popcorn kit instead! Offering you the same great features and functions as the Paragon kit, the Carnival King offers comparable quality but is sold at a lower price. Both kits are for 6 oz. poppers and offer convenience by offering everything you need to serve fresh hot popcorn!